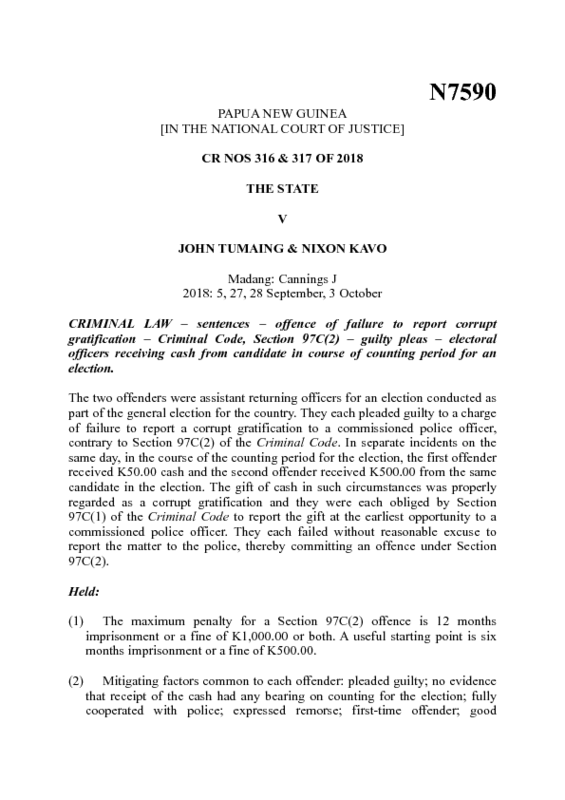 Sentencing decision in the case of two assistant returning officers convicted of failing to report a corrupt gratification during the 2017 general election count. The two men received gifts of K50 and K500 respectively from candidate Peter Yama. Yama was elected to parliament as Governor for Madang Province. He has never been charged in relation to the matter. months imprisonment or a fine of K500.00. the K500.00 given to him. such incidents can cast doubt on the integrity of an election. report a corrupt gratification under Section 97C(2) of the Criminal Code. officers for the Rai Coast Open seat. 5. Neither offender has any prior convictions. John Tumaing: I am sorry for what I have done. I thought the election was over. Please show leniency. I am the breadwinner for my family. was given, as it was all recovered by the Police. prepared a pre-sentence report on each offender. living near Balasigo market in recent times while this case has been going on. He has an informal sector income. His health is sound. • step 1: what is the maximum penalty? • step 2: what is a proper starting point? • step 3: what sentences have been imposed for equivalent offences? • step 4: what is the head sentence? • step 5: should the pre-sentence period in custody be deducted? • step 6: should all or part of the sentence be suspended? STEP 1: WHAT IS THE MAXIMUM PENALTY? with the provisions of Subsection (1) is guilty of an offence. not exceeding 12 months, or both. STEP 2: WHAT IS A PROPER STARTING POINT? 14. I use a starting point of six months imprisonment or a K500.00 fine. STEP 4: WHAT IS THE HEAD SENTENCE? to the Police (and is now in the custody of the Court). people involved in elections, both candidates and electoral officials. sentence, which is nine months imprisonment each. DEDUCTED FROM THE TERM OF IMPRISONMENT? 20. Yes, it is one day in custody for each offender. should not be detained in custody to serve the rest of the sentence.